(CNN) -- President-elect Barack Obama is looking forward to Monday's White House transition talks with President Bush and is already examining ways to make a quick impact upon taking office, top Obama aides said Sunday. President-elect Barack Obama will meet President Bush on Monday afternoon in the White House. "I think it was very gracious of President Bush to invite him so early -- usually it happens a little later in the process," Valerie Jarrett, one of the transition team's co-chairs, told reporters. "I think because of the daunting challenges that are facing our country, President Bush thought it was important to move forward quickly." A prominent Democratic source close to Obama said Jarrett is also Obama's choice to be named to take over his seat in the Senate, though Illinois Gov. Rod Blagojevich would have the final say over a replacement. And John Podesta, the other co-chair, said the talks are likely to cover "a broad range of issues" -- but the slumping U.S. economy is expected to dominate the discussion. Podesta told CNN's "Late Edition" that Obama will push Congress to enact "at least part" of an economic package before he takes office in January, but said the problems Americans face need short-term and long-term approaches. "It's clear that we need to stabilize the economy, to deal with the financial meltdown that's now spreading across the rest of the economy. The auto industry is really, really back on its heels," Podesta said. And Obama's designated White House chief of staff, Rahm Emanuel, said the government needs to consider "fast-forwarding" $25 billion in low-interest loans already approved by Congress to help the Big Three U.S. automakers retool for more efficient vehicles. iReport.com: Who should be in Obama's cabinet? 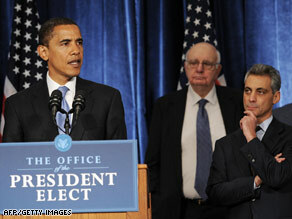 "They are an essential part of our economy and our industrial base," Emanuel told CBS' "Face the Nation." He added: "There are existing authorities within the government today that the administration should tap to help the auto industry." Senate Majority Leader Harry Reid and House Speaker Nancy Pelosi, both Democrats, urged Treasury Secretary Henry Paulson over the weekend to extend the $700 billion bailout of the financial industry to shore up the ailing Ford, Chrysler and General Motors, which have been battered by the credit crisis and poor sales of gas-guzzling sport utility vehicles. But Treasury spokesperson Brookly McLaughlin said Sunday that the department remains focused on the financial sector and restarting stalled lending. Podesta said Congress could extend unemployment benefits for laid-off workers and provide assistance to states grappling with increased Medicaid costs quickly. But he said efforts to improve schools, expand health-care coverage and wean the nation's energy industry away from imported fuels "need to be tackled together." "As a candidate, Senator Obama said that he wanted all the Bush executive orders reviewed and decide which ones should be kept and which ones should be repealed and which ones should be amended, and that process is going on. It's been undertaken," Podesta said. Podesta said Obama's team will be "looking at -- again, in virtually every agency -- to see where we can move forward, whether that's on energy transformation, on improving health care, on stem cell research." Podesta said there is a lot the president can do without waiting for Congress, and voters can expect to see Obama do so to try to restore "a sense that the country is working on behalf of the common good." "I'm sure they'll be open and frank, as I'm sure they've always been able to talk to one another," Jarrett said. "So I think it's a good sign for this country that they're having this meeting when they're having it, and we look forward to the days and weeks ahead." At the same time, first lady Laura Bush will take Obama's wife, Michelle, on a tour of the executive mansion. Podesta said cooperation with Bush administration officials has been "excellent" since Tuesday's election.